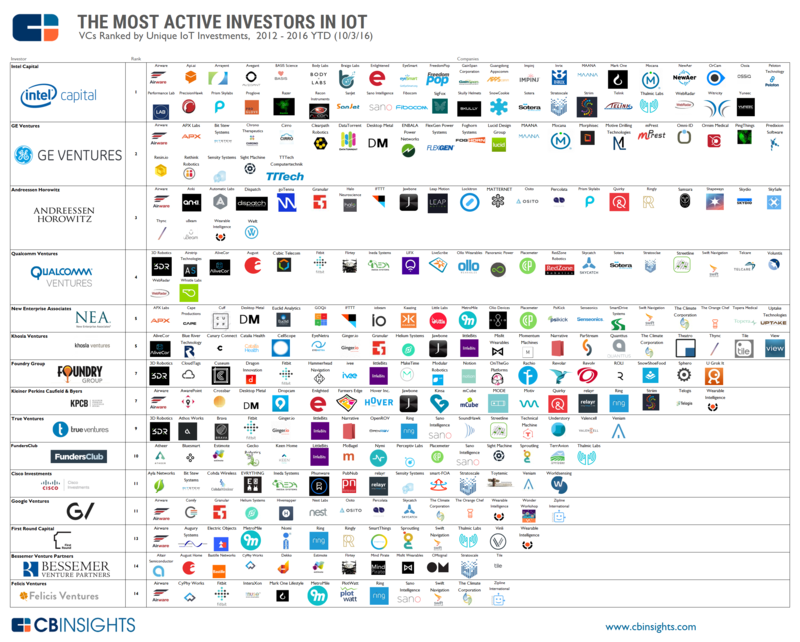 Most Active VCs In The Internet Of Things – IIoT Rules! The Internet of Things (IoT) industry is on track to see nearly $3.7B in funding this year as connectivity and software are injected into sensor-laden objects and appliances. An increasing proportion of these dollars are being allocated to startups working specifically on the industrial IoT. Intel Capital still tops the list as the most active investor in IoT startups, with more than 40 unique IoT companies since 2012. GE Ventures wasn’t far behind (and is new to the ranking of top IoT investors) with recent investments in industrial-focused IoT startups like industrial analytics developer Sight Machine, fog computing platform Foghorn Systems, and commercial 3D printing startup Desktop Metal. Following Andreessen Horowitz, the fourth-most active IoT investor is another CVC, Qualcomm Ventures. As CBInsights noted in prior investor roundups, Intel and Qualcomm are involved in designing and/or manufacturing ever-smaller chips to power mobile devices, and IoT likely offers them strategic value. According to Wing VC (see reference& postcript below), Industrial/Enterprise IoT accounts for the largest number of funding deals over the past few years, followed by Wearables. At the IoT Tech Expo session where it was presented, the VC panelists praised Martin Giles of Wing VC for his excellent assessment of the IoT start up environment/state of the industry. One key point is that startups in some IoT categories/industry verticals are not attracting the big $ funding envisioned. Industrial IoT leads the way forward in deals. Also, total $ start up funding deals is decreasing as per slide 26. Meanwhile, the total # of IoT M&A deals is decreasing while the # of large M&A deals is increasing, as per slide 29. I’m very optimistic about IIoT, especially from companies like GE, Caterpillar, Siemens, Bosch,and other industrial equipment heavyweights. by David Dixon & Mike He of FBR & Co.
An elegant Ericsson and Nokia driven network upgrade plan that from inception created a 10X increase in capacity continues to bear fruit for TMUS, as seen in strong 3Q financial and preannounced subscriber results. The recent launch of the T-Mobile One unlimited plan and market perception of T-Mobile as a value leader are resonating well with consumers, as both net add and churn were well ahead of Street estimates. After more than three years of continuous share taking, we believe TMUS is close to full network capacity. We expect Sprint to build momentum from here, and even though heightened competition has forced both VZ and T to diverge their businesses away from wireless while undergoing a network topology shift that favors edge application processing, storage, and content, we think margin pressure is likely needed for TMUS to gain more market share. As more of the device base are seeded with 700 MHz, this will accelerate the capacity crunch that could stymie momentum. ■ 3Q16 results recap. Consolidated revenue of $9.2B (+17.8% YOY) was modestly ahead of our $9.1B estimate but below the consensus $9.5B estimate, consisting of 13.2% YOY growth in service revenues, +37.6% YOY growth in equipment revenues, and 26.0% YOY growth in “other” revenues. Adjusted EBITDA of $2.6B were meaningfully ahead of our Street-comparable estimate of $2.4B, driven by strong cost discipline and a strong top line that benefited from strong market acceptance of T-Mobile One plans. Postpaid net adds were 969,000 with churn of 1.32%, and prepaid net adds were 684,000 with churn of 3.82%. ■ Capacity expansion going well—capacity crunch ahead? May improve M&A approval chances. Management recently lit AWS-3 spectrum and plans to leverage unlicensed 5 GHz spectrum in 2017 using LTE-U and LAA, followed by unlicensed 3.5 GHz LTE spectrum in 2018. Covered PoPs under extended-range LTE on 700 MHz A-block increased by 25M during the quarter to 225M, with overall covered PoPs of 312M almost in line with VZ. Coverage improvements drive a 4x increase in capacity. A spectrum-constrained T-Mobile may increase the probability of regulatory approval of a Sprint merger. ■ T-Mobile raised FY16 guidance. Management raised full-year branded postpaid net adds and adjusted EBITDA guidance following 3Q results. Brand postpaid net adds are now expected to be in a range of 3.7M–3.9M, up from 3.4M–3.8M. Adjusted EBITDA guidance has been raised to $10.2B–$10.4B from $9.8–$10.1B. 1. Can T-Mobile continue to take market share? We believe Ericsson and Nokia in 2012 provided an elegant blueprint for T-Mobile to add capacity at low cost for three to four years under the current capex envelope. Today, our industry checks suggest that T-Mobile is facing capacity challenges and that adding 700 MHz coverage spectrum (although only used 17% of the time, according to the latest Root Metrics results) will increase demand for capacity spectrum by 4x, exacerbating performance challenges. We also believe that capacity demand elasticity for BingeOn will prove challenging as a broader set of customers sign up for free video service. Indoor coverage is still the differentiator, and T-Mobile faces variable performance in this area due to its reliance on voice over Wi-Fi, but this should improve with 700 MHz spectrum and the ability to add 600 MHz ahead of the 39-month clearing time frame. 2. What is the outlook for Sprint’s ability to improve its momentum in the market? We believe Sprint is starting to leverage its 2.5 GHz spectrum portfolio to greater effect and should be able to improve its performance in multiple markets across the U.S. going forward. Indoor coverage improvement from small cells, increasing device power, and higher-power 2.5 GHz transmitters could drive market share gains going forward at the potential expense of T-Mobile US. 3. What is the outlook for M&A in the wireless segment? We believe T-Mobile US lack of new spectrum capacity, coupled with inferior coverage from both T-Mobile and Sprint, suggests a merger could be revisited under a new FCC administration in 2017. Given our contrarian outlook for capacity spectrum valuation one of the three valuation components for a wireless company (spectrum, network, and customers) we believe Comcast is less likely to seek to acquire T-Mobile but may instead enter the wireless segment through a low-cost coverage network and lowcost indoor capacity network. Lastly, we believe there is greater synergy for a deal with Sprint relative to DISH Network. T-Mobile holds a smaller amount of absolute spectrum than its larger competitors. As T-Mobile expands and adds more customers to its LTE network, the company’s smaller spectrum holdings will require higher capex (cell-splitting) and higher variable operating costs (larger amount of leased back-haul). T-Mobile does not own a substantial spectrum position below 1 GHz. T-Mobile’s network operates primarily in the AWS (1700 MHz) and PCS (1900 MHz) bands with roaming on AT&T at 850 MHz. The lack of lower-frequency spectrum for data impedes in-building coverage, which could lead to higher churn. The company could compensate by adding more cell towers or by winning the upcoming incentive spectrum auction for 600 MHz spectrum. Overall industry risks continue to center on pricing pressure, particularly in the business segment and accelerated wireless substitution in the consumer segment. Economic recovery factors continue to play key roles in a sector where growth in wireless subscribers, growth in revenue from existing subscribers, and enhanced wireline services are large determinants of growth. Deutsche Telekom AG owns a majority stake in T-Mobile US. Deutsche Telekom AG owns roughly 65% of TMUS common stock. The low float could potentially impede the stock from achieving our price target and create difficulties for institutions that may want to build positions. Based in Bellevue, Washington, T-Mobile US, Inc. is a wireless communications services operator that provides wireless voice, messaging, and data services in the U.S., Puerto Rico, and the U.S. Virgin Islands. T-Mobile’s network covers 96% of the U.S. population through its EDGE 2G/HSPA 3G/HSPA+, 4G/4GLTE LTE networks. T-Mobile operates its business under three brands, including T-Mobile, MetroPCS, and Go Smart Mobile. While T-Mobile has benefited in earnings growth, lower churn, and subscriber growth from its network overhaul, we see limited organic growth opportunities beyond the next two years due to growing network capacity challenges. Sprint’s strong fiscal 2Q results highlight that the turn around is on track. We e material improvements ahead, and believe Sprint is close to cash flow inflection by sustaining low capex spending and progressive interest expense reductions. Relative to TMUS, we believe Sprint is better positioned for long-term sustainable growth due to ample excess spectrum capacity. * Management achievements have been significant. Leveraging network vision upgrade tailwinds, management has done well to enhance franchise value through effective re pricing, marketing and distribution improvements, while slimming down beyond expectations. As it pivots to a (still poorly understood) new network coverage and capacity model with 5 G attributes, management is demonstrating it can spend less on the network while maintaining performance by garnering greater-than-expected utility from its 2.5 GHz spectrum asset. * Much more to come in 2017. We think management can maintain low capex spending as it ramps low-cost indoor voice and tri-band LTE data small cells to improve indoor coverage; achieve 3GPP approval for high-power UE in December, which will increase network coverage area by 40%. Vendor checks highlight that prototype testing shows a link budget in line with the 1.9 GHz grid, which suggests less high-cost densification will be required. Checks with power amplifier and filter companies indicate high-power devices will be available in 2017. * M&A potential still exists. Vendor checks suggesting TMUS is close to full capacity and in need of expensive densification may increase the chances of regulatory approval for a merger with Sprint. Cable companies are also a potential buyer but we discount this as we think cable is more of a strategic threat to wireless via an organic WiFi box upgrade cycle to include cellular on spectrum bands offered free to customers. On October 22, 2016 AT&T (T) entered into an agreement to acquire Time Warner (TWX) for cash and stock valued at $107.50/share. AT&T trades at 6.5x EBITDA and despite expecting $1B in cost and revenue synergies over three years is paying an unprecedented high 13.5x EBITDA multiple to enter the programmed content business. Management hopes this expensive acquisition can help defend its wireline and wireless franchise value to a greater extent than it can organically. While we see significant regulatory scrutiny, it is hard to see how this deal could be blocked following approval (with remedies) of the Comcast/NBC deal. Bottom line, we view this as modestly negative for AT&T because absent this deal management faces an even greater strategic threat to its core business. ■ A hedge against streaming risks as the market moves away from programmed media. Over time, streaming bills may match cable bills as customers sign up for multiple streaming subscriptions. We think AT&T is likely planning to morph HBO into a streaming competitor to Netflix, combining DC Comics/Warner Bros/Cartoon Network/HBO’s content. We see a network and strategic advantage owning in content deployed closer to edge at low cost versus interconnection with third-party content. Benefits include ad insertion, more effective content distribution to the network edge, and the ability to package content that does not count against data caps. ■ High (but achievable) regulatory hurdle. We expect the deal to face significant regulatory scrutiny from the DOJ, though a lack of jurisdiction means the deal may not be reviewed by the FCC. CMCSA’s 2009 acquisition of NBC Universal will likely serve as the relevant precedent through which regulatory officials will assess the proposed merger amid a new era of media consolidation. While we see significant regulatory scrutiny, it is hard to see how this deal could be blocked by the DOJ following approval (with appropriate remedies to ensure nondiscriminatory content access) of the Comcast/NBC deal. ■ Acquisition details: TWX shareholders will receive $107.50/share under the terms of the merger, comprised of $53.75/share in cash and $53.75/share in T stock. The stock portion will be subject to a collar such that TWX shareholders will receive 1.437 T shares if T’s average stock price is below $37.411 at closing and 1.3 T shares if T’s average stock price is above $41.349 at closing. This purchase price implies a total equity value of $85.4B and a total transaction value of $108.7B, including TWX’s net debt. ■ Debt leverage a short-term concern. AT&T plans to issue $40B in new debt to fund the cash portion of the deal, which would increase its total debt to $175B. However, management plans to reduce debt to EBITDA to 2.5x one year after closing, which is slightly higher than current levels. While rates remain close to zero, interest rate risk is high, and AT&T will need to refinance $9B per year. ■ Sector implications of a successful transaction. We see this as a modest negative for AT&T, but absent this deal, we think management would face an even greater strategic threat to its core business. We view this deal as neutral for Verizon, Sprint, T-Mobile, and cable companies, as equal economic rights to content will likely be mandated by regulators as one of the key remedies. We see a potential negative outcome for LVLT and CCOI as Time Warner content migrates from third parties to AT&T. Lastly, aside from our negative (spectrum supply shock based) investment thesis for DISH, we view a successful outcome as negative for DISH, as an AT&T/DISH deal would be less likely. ■ Conference call: AT&T hosted a conference call on October 24 at 8:30 a.m. ET to provide further details on the merger announcement and 3Q16 results. Buying Time Warner Inc. will make AT&T Inc. among the most heavily indebted companies on earth. In a deal announced Saturday, AT&T agreed to pay $85.4 billion to buy the owner of CNN, HBO and TNT networks. Including debt, the value grows to $108.7 billion. And to finance the half-cash, half-stock deal, AT&T is taking on $40 billion of bridge loans. AT&T, the largest nonfinancial corporate issuer of dollar-denominated debt, already has about $119 billion in net debt—roughly double what it was five years ago. “This would put them, I think, within striking distance of the financials with respect to unsecured bond issuance,” says Mark Stodden, a credit analyst at Moody’s. Mr. Stodden estimates the carrier’s total debt load will grow to as much as $170 billion if the deal is approved. AT&T hasn’t said precisely how much debt it plans to issue to fund the transaction, but estimates that by the end of the first year after the deal’s close, net debt will be around 2.5 times its adjusted earnings, up from 2.24 times at the end of the third quarter. AT&T’s acquisition of TWX overshadowed soft 3Q16 results including weakness in wireless subscriber growth. Postpaid net adds were 21,000, and prepaid net adds were 304,000, compared to 23,000 and 466,000 in the year-ago period, respectively. Overall video connections declined a modest 0.5% year over year, but U-verse connections declined a whopping 22.9% year over year, which was partially offset by 6.2% year-over-year increase in DIRECTV. Weak 3Q video subscriber results underscore the competitive headwinds AT&T is facing in all facets of business in the U.S. market. While AT&T is at the forefront of IoT (Internet of Things) and should be the first to reap benefits, some of the potential upside could be offset as its core subscriber base continues to weaken. While management touts TWX as a content and distribution play, we believe it is largely a defensive decision driven by: (1) greater regulatory pricing pressure on wholesale interconnection and business data service prices in the wireline segment, (2) a constrained capex budget that limits AT&T’s ability to roll fiber fast enough to address a competitively disadvantaged broadband product relative to cable, (3) a strategic 5G wireless threat from cable, and (4) higher programming costs. Management banking on vertical integration as key to deal approval: While the deal will certainly face significant regulatory scrutiny, we believe regulatory approval is achievable given the precedence set by CMCSA’s acquisition of NBC Universal. Management appears confident given the distinction of vertical integration of premium content versus horizontal integration of the failed TMUS acquisition in 2011. Possibly other suitors for TWX: We believe AT&T’s rushed attempt to announce the TWX acquisition, only two weeks ahead of the presidential election, suggests there might be additional suitors for TWX. We think management agreed to a premium multiple to mitigate interest from other, less-capitalized bidders. Don’t Bring Time Warner Cable Into This AT&T Deal! AT&T and Amazon Web Services (AWS) signed a multi-year, strategic alliance agreement focused on the delivery of integrated solutions built on the companies’ respective cloud and networking capabilities. The collaboration is designed to help both existing and new customers more efficiently migrate to and utilize the AWS Cloud with the AT&T network. The solutions are intended to span cloud networking, mobility, Internet of Things (IoT), security, and analytics. • Strengthens an existing alliance by providing an avenue for both companies to reach a burgeoning prospect pool of companies that need help building out their cloud-based hybrid infrastructures, with a specific emphasis on IoT. • AT&T’s NetBond element provides a trusted, secure connectivity solution to tie together assets on the customer premises and resources running on AWS’s cloud. Editor’s Note: We wrote about the inner workings of NetBond in this blog post. It provides a huge advantage for end users who are able to access a Cloud Service Provider’s point of presence as a node on their IP-MPLS VPN from AT&T. A proprietary routing protocol is used in NetBond. It’s based on proprietary intellectual property AT&T refers to as “Intelligent Route Service Control Processor (IRSCP).” That technology is used to dynamically change the routing (end to end paths) in the network to respond to operational changes, new customers, more or less traffic, and to automatically recover from failed network nodes or links. • Promises a simplified path for customers that want to leverage the Amazon Cloud for their IoT implementations by preconfiguring AT&T IoT-connected sensors and devices to connect and collect and process data in the AWS environment. • Integration with the AT&T IoT Starter Kit and IoT Data plans are also part of the deal, giving customers more enablement tools to build their own solutions using AT&T IoT and AWS IoT. • Adds AT&T’s sophisticated Threat Intellect analytics to help protect what can be complex and expansive IoT environments spanning AWS’s cloud and the customer’s premises. • Gives AT&T access to a vast amount of AWS data on activity that its Threat Intellect machine learning technology can mine for threat activity, information which will inform the platform as a whole and benefit all of its security customers. • As potentially promising as this deal is, AWS works with other service providers which can also provide secure connectivity solutions. • Likewise, AT&T also has similar engagements with other top IaaS and IoT PaaS providers, so this isn’t entirely unique. • As comprehensive as a joint solution may be, customers will still have to grapple with often complicated deployments which may require additional third-party support. • Positive on AWS and AT&T’s expanded alliance, because the team is providing a much-needed resource for customers which need both a secure end-to-end hybrid cloud solution and integration and migration support. The companies are playing to their relative strengths to join forces in an effort that brings both the connectivity and the data center elements together and adds very sophisticated security to provide important reassurances to customers seriously contemplating moving critical assets into the cloud. • Moderate to AWS and AT&T, because the alliance does more than fill in a gap or a check box; it combines their respective strong suits to create an end-to-end solution targeted toward a prospect pool looking for a practical and secure path to build out hybrid cloud architectures. In highlighting IoT specifically, the providers are signaling that they are positioning themselves to tap into a sector which is ramping up for major growth in the coming years. • Moderate on the hybrid cloud sectors, because while both companies partner with multiple providers and this deal is not exclusive, the depth with which AWS and AT&T are engaging with one another signifies this is an alliance that should have real impact on both the customer targets and the competitive landscape. This alliance also should yield results beyond cloud and IoT as the AWS Cloud becomes a source of threat intelligence that AT&T can use not just to protect its customers, but also to help inform the IT industry as a whole. Globally, EAD revenue reached $516 million in H1 2016, owing to the continued adoption of Ethernet connections in mobile backhaul, broadband, business and carrier wholesale applications. Segment-wise, EoTDM declined by 3 percent, but fiber grew 4 percent and EFM increased 4 percent. Although fiber is the future of the EAD market, copper continues to play an important but limited role for Ethernet services. But the use of copper is declining in lower-speed segments; for example, 100M copper EAD ports dipped 12 percent in H1 2016 from H2 2015. In H1 2016, ADVA became the new EAD revenue market share leader, boosted by its acquisition of Overture. Previous market leader Ciena was number-two, followed by RAD, Actelis and MRV. North America remains the largest market for EADs, garnering 58 percent of EAD revenue in H1 2016, trailed by EMEA, Asia Pacific and CALA. 7 percent, largely driven by business, broadband and building applications, the largest market segment by that point, overtaking mobile backhaul. The biannual IHS Markit Ethernet Access Devices (EADs) report tracks fiber and copper (EFM bonded and EoTDM bonded) EADs by port speed, form factor and application. The report provides worldwide and regional market size, vendor market share, forecasts through 2020, analysis and trends. Facebook recently filed documents with the FCC to request the right to operate a drone over its Menlo Park, CA campus using an experimental radio in the 2.4 GHz band. The company plans to fly at least one small, wireless-beaming drone at an altitude of 400 feet around its headquarters in the coming months. The smaller drone is simply being used to test the wireless technology, which Facebook thinks could be used with its larger Aquila drones which are for wireless broadband Internet access in developing countries. “The purpose of this operation is to test potential new communications applications and equipment in a controlled, low-altitude airborne environment,” one filing says. Another filings specifies the drone will fly at an altitude of 400 feet. The filings, which Facebook made under its FCL Tech drone subsidiary, says it wants to conduct the tests between October and April. Mike Johnson, Facebook’s Deputy General Counsel, is listed as the point of contact on the filing. Abstract: Wide-scale deployments of Unmanned Aircraft Systems (UAS), or drones, are expected to reshape countless industries, including agriculture, delivery, insurance, public safety, and real estate to name a few. Cellular networks can bring a new dimension of reliability, security, coverage and seamless mobility to commercial drone operation, enabling connectivity and control of drones Beyond Visual Line Of Sight (BVLOS). This will be key to safe, wide-scale drone operation and the many new services enabled by them in the years to come. AT&T and Qualcomm are joining forces to trial drone operation on AT&T’s commercial 4G LTE networks — testing key performance indicators (KPI’s) such as coverage, signal strength, throughput, latency and mobility under various real-world scenarios. Findings from this research will not only help us optimize 4G LTE networks for safe and reliable drone operation, but also inform positive developments in drone regulations and 5G specifications as they relate to wide-scale deployment of numerous drone and other mission-critical use cases. Discussion: Greg Belaus (gb078w@att.com), Lead Business Development – UAV, Internet of Things (IoT) Solutions Group, said AT&T’s “drone play” was to build a technology foundation for connected drones that would create a supporting ecosystem which is part of the Internet of Things (IoTs). AT&T plans to use drones for: cell tower inspection, a venue for real time performance validation, potential future use cases, eg. flying Cellular On Wheels (COWs). AT&Ts IoT Solutions Group is developing drone solutions for AT&T’s business customers. Qualcomm is helping to build the drone ecosystem foundation. It will be used to characterize AT&Ts commercial LTE network at altitude, across its network infrastructure and locations. Recordings will include: flight path, time of day, network parameters (e.g. frequencies, hand-offs). The trials will analyze how UAS can operate safely and more securely on commercial 4G LTE and wireless networks of the future (such as “5G”). The research will look at elements that would impact future drone operations. –>A key objective is to optimize AT&T’s LTE network for safe drone operations that use it. As noted in an earlier blog post, the 9th annual Telecom Council Carrier Connections (TC3) Summit was held Sept 29th and 30th, 2016 in Mt View, CA. A second TC3 article on 5G regulation is here. In his opening remarks, Telecom Council Chairman Derek Kerton stated that telcos have turned to start ups for innovation, rather than expanding their own labs. He noted that Network Function Virtualization (NFV) and Virtual Network Function (VNF) have the potential to dis-intermediate the supply chain which presents a huge opportunity for networking software start-ups. It provides telcos with agility and increased speed of deployment by converting traditional network hardware functions into software (e.g. virtual appliances) running on generic compute servers. One such opportunity not specifically mentioned, but described in TC3 sessions, was Software Defined (SD)-WAN. It’s intended to be an overlay of existing corporate WANs that offers many benefits to both telcos and their enterprise customers. We review the two TC3 SD-WAN sessions in this post. Both took place on September 30, 2016. The Summary & Conclusions section provides this author’s opinion on this topic. Abstract: SDN is a big telecom trend that builds on the progress made in NFV. That is, essentially, leveraging virtualization constructs to improve the cost, performance, and reliabilit. But SD-WAN is a specific application of SDN that applies mostly to enterprise networks. It is a product that an enterprise can build, or buy from a network operator. SD-WAN provides a layer of abstraction that lets the enterprise build a reliable virtual network across branches (similar to MPLS), but to do so by using cheaper, lower quality wide-area links and commodity hardware. Control in an SD-WAN is shifted to the cloud, either aaS from a network operator, or managed by the IT department of the enterprise. This session will discuss what SD-WAN means for the long-standing partnership between carriers and their largest enterprise customers, and the technology gaps startups can fill. Summary: SD-WANs have the potential to disrupt the way enterprise WANs are built and managed, according to Chris. He said the SD-WAN focus is connecting corporate headquarters to branch offices with centralized network management. There are a lot of start-ups in that space using general purpose hardware with Intel Xeon processors, he said. A key advantage of SD-WAN was said to be software based network reconfiguration. It uses “SDN principles” like programmability and abstraction of functions, but not necessarily the classical SDN definitions of separate Control and Data planes with a Centralized SDN controller with global visibility and path selection. NTT has been working with US based SD-WAN software vendors to evaluate their “platform” solutions, according to Komuro-san. However, they have not yet made a decision on a specific SD-WAN platform, which must be integrated with their existing network. Some of the new SD-WAN vendor entrants mentioned include: Viptela, Nuage Networks (owned by Nokia), Velo Cloud, Cloud Genix, Versa, and iGlue. Note 1. Virtual customer premise equipment (vCPE) is a way to deliver network services such as routing, firewall security and virtual private network connectivity to enterprises by using software rather than dedicated hardware devices. By virtualizing CPE, providers can dramatically simplify and accelerate service delivery, remotely configuring and managing devices and allowing customers to order new services or adjust existing ones on demand. In closing, Komura-san reiterated that NTT-Communicaitons needs to make a decision on “the SD-WAN platform business.” He did not provide timing for that decision. In answer to a question from this author, Chris admitted there were no standards for SD-WANs which implies no interoperability, i.e. single vendor solution for a given network provider and no SD-WAN inter-networking. That’s a big risk when the single vendor is a start-up! See Conclusions section below for more on this theme. Summary: Deutsche Telekom has set-up a SD-WAN test bed between the U.S. and Germany, enabling it to demonstrate simplified orchestration and rapid deployment of industrial networking. Using VeloCloud’s SD-WAN solution, Deutsche Telekom (DT) interconnected its Telekom Innovation Labs’ headquarters in Berlin with its Silicon Valley Innovation Center (SVIC) in Mt View, CA, to prototype an agile, responsive industrial network with minimal cost and management impact to existing private networks. The use case was remote 3D printing and monitoring between Berlin and Mt View. VeloCloud’s SD-WAN equipment consists of three software controlled boxes: Edge, Gateway and Orchestrator. The SD-WAN solution was said to enable enterprises to support application growth, network agility and simplified branch implementations while delivering optimized access to cloud services, private datacenters and enterprise applications. Global service providers are able to increase revenue, deliver advanced services and increase flexibility by delivering elastic transport, performance for cloud applications, and integrated advanced services all via a zero-touch deployment model. According to Sathyanarayana, with a network powered by VeloCloud for this next-generation project in place, Deutsche Telekom Innovation Laboratories in Berlin and Mt View were able to validate SD-WAN architectures and capabilities supporting industrial 3D and robotic automation. However, no commercial service or business arrangement was announced between DT and VeloCloud. Michael Wood said that VeloCloud has 130 partner companies, including telcos and system integrators who could provide their SD-WAN solution in Germany. A “software defined enterprise WAN” (SD-WAN) is an overlay network with IP-MPLS VPN as the most common underlay network. A key point that no one seems to talk about is that the software controlled overlay network must interface with the underlay network, especially in the event of failure and recovery/restoration. Currently, there are no standards and hence no cross network or interoperability of network vendor equipment and/or software. Each network provider’s SD-WAN is unique to that provider and is often a single vendor solution due to the lack of interoperability standards. Chris Cavigioli of Intel had suggested ONUG might play a role in specifying SD-WAN interoperability2. But ONUG is hardly a standards body! It’s an organization of end users pursuing requirements for open networking. Note 2. ONUG has an Open SD-WAN Exchange (OSE) initiative, which is an open framework to allow for one vendor SD-WAN solution to directly talk to another vendor SD-WAN solution without reliance on underlying infrastructure and/or protocols. The “Open SD-WAN Exchange use cases address marketplace M&A, business partner connectivity, Cloud/Service Provider network connectivity, technology transition and vendor lock-in mitigation. Hence, we see SD-WANs being deployed in segments of a carrier’s enterprise WAN network. There’s a serious concern that without standards or any type of interoperability between different vendor SD-WAN platforms, a service provider would be in a lot of trouble if the start-up they were using for that platform went out of business or their SD-WAN solution was not as robust as advertised or thought. Steve Yung, Chairman & CEO, V5 Systems Inc.
Nik Tehrani said DynoSense is pursuing medical monitoring/measurements and cloud based data analytics as part of the digital health revolution. He outlined a five step process for DynoSense IoT systems: 1) sensor captures data; 2) data analyzed by cloud based compute servers; 3) results of analytics are resolved; 4) respond if something has gone wrong (anomaly detected); 5) repeat and re-use the system. From their website, the company was founded on March 13, 2013 (so is only a little more than three years old). Steve Yung said V5 Systems provides a self powered outdoor IoT platform which includes sensors, wireless communications, power management, storage, edge computing and edge security. V5 provides a multi-layer IoT stack to facilitate those functions. Steve said the health care market was said to be huge and growing at 75% to 80% with people looking for real time information. A shift from reactive to proactive health care is in process, according to Yung. Aging population needs help with more assisted living, especially in Japan. Chronic care accounts for 75% of US health care expenses. Corporate wellness programs lower abstenteeism and increase productivity. There’s more involvement from health insurance companies and contract research organizations (CROs). PK noted the wide range of technologies needed to make IoT a reality: sensors, electronics, power management & control, connectivity (local and remote communications capabilities), edge computing, security, data analytics, cloud computing & storage. How those all work together and cohesively is a real challenge. Prashant opined that use cases will be very important for IoT. GE Digital has created a “Digital Twin” analytics model that was used to improve efficiency at wind farms. Each digital wind farm begins life as a digital twin (play the game), a cloud-based computer model of a wind farm at a specific location. The model allows engineers to pick from as many as 20 different turbine configurations – from pole height, to rotor diameter and turbine output – for each pad at the wind farm and design its most efficient real-world doppelganger. The many digital twin opportunities for GE start with its big machines — aircraft engines, locomotives and gas turbines. Using the digital twin approach, a GE service team will know not only when to bring an aircraft in for inspection but what parts to have on hand and how long the jet will be out of service. The company’s innovative products are patented, advanced, and cloud-based health scanning platforms with health metrics and analytic engines that can be integrated into communities of caregivers, trainers, pharmacists, doctors, and family members. Addendum: On Oct 3, 2016, Plus3.com and DynoSense Corp. announced an exclusive U.S. market strategic partnership to create a new and compelling corporate wellness offering that blends Plus3’s best-in-class socially-driven well being platform with DynoSense’s innovative home health monitoring system, all bundled in easy-to-use web and mobile apps. Key features of V5’s outdoor IoT system include power management and ability to train sensors to recognize offsets. Global security is the #1 issue for IoT, according to Steve (this author agrees). Multi-disciplined expertise (EE’s, ME’s, software engineers, computer scientists, algorithm developers, etc) are all needed to make IoT a reality. Jeth then provided a four step process for IoT development: Design, operate, optimize, and restore. The necessary IoT functional components are: sensors, edge electronics, gateways, connectivity, data platforms, analytics and security. He noted there were over 200 IoT platforms (many industry specific) from vendors like Amazon, HP Enterprise, IBM, and many others and admitted it was quite difficult to sort them out. In addition to being a distributor of hardware and providing software solutions, Arrow has also gotten into the systems integratrion business by providing hardware/software sub-systems for different IoT solution providers.